Alexander Solzhenitsyn shot to fame in the USSR with his 1962 novella "One Day in the Life of Ivan Denisovich"
A decade after the hugely influential author's death, some young Russians admit to only a passing knowledge of Russian dissident writer Alexander Solzhenitsyn, who won a Nobel Prize for chronicling the horrors of the Soviet Gulag. "Solzhenitsyn was a dissident, someone who opposed the Soviet regime and he was a great writer," summed up Alexander Polyakovsky, 23, who is studying international relations. He admits he has not read any of the author's books. "They talked about him a bit when I was at high school, during the Russian literature lessons, but I don't remember too much," he added. Rather than hearing about Solzhenitsyn from teachers, "it was my mother who explained to me that he was one of the greatest writers of the 20th century," Polyakovsky said. By contrast, his mother Yelena emotionally described how she discovered one of Solzhenitsyn's works hidden among the family's books during the Soviet era. "I was a teenager and my parents drilled it into me that I mustn't tell anyone we had the book at home. It was a forbidden fruit," she said. "It was such a different era that it's hard for my son to imagine it," she added, explaining his lack of interest. Solzhenitsyn, who died on August 3, 2008 at the age of 89, shot to fame in the USSR with his 1962 novella that was the first in Soviet literature to describe everyday life in a prison camp, "One Day in the Life of Ivan Denisovich." It was based on his own experiences of seven years of imprisonment for criticising Stalin. Solzhenitsyn's most widely read book, "The Gulag Archipelago," a lengthy chronicle of the workings of Soviet terror, sold millions of copies after being smuggled out and published in Paris in 1973. 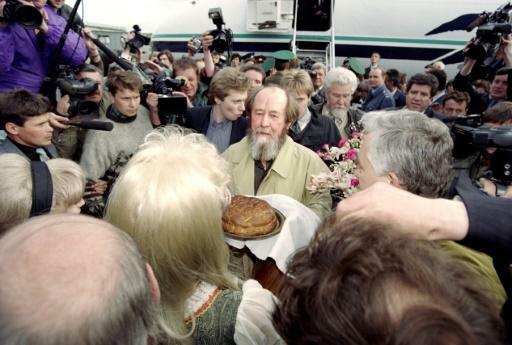 Solzhenitsyn was expelled by the Soviet authorities soon after and spent 20 years in exile in the United States before returning in triumph to Russia in 1994. Alexander Altunyan, who teaches journalism at Moscow's International University, also notes the younger generation has little interest in Solzhenitsyn's weighty historic tomes and grimly realist novels such as "Cancer Ward." "Out a class of 30 students, no more than two or three will have read a book by Solzhenitsyn. Most of them don't know a thing about him." School teachers say they have to choose which books on the curriculum to focus on in literature lessons and some get the bare minimum of class time. Yet some do focus on Solzhenitsyn, saying his moral and political views are still relevant. "We really do need to read Solzhenitsyn today as there are more and more attempts to deny Stalin-era repressions, when some people say nothing terrible happened in that era," said Olga Mayevskaya, a teacher of Russian language and literature. She said she spends several lessons on books by Solzhenitsyn including "One Day in the Life of Ivan Denisovich" and "Gulag Archipelago." "I quote the most powerful passages of Gulag Archipelago to my students," she said. "What's unbelievable is that they are not told about this in history lessons. This is the history of our country. They have to know it so it does not happen again." Russia in recent years has seen a strong tendency to present Stalin in a positive light, while officials downplay the repressions and forced collectivisation that killed millions. Nevertheless, Solzhenitsyn remains a touchstone to many Russians. A poll last year by state pollster VTsIOM on Russians' "idols" from the 20th century put Solzhenitsyn fifth, behind such figures as cosmonaut Yuri Gagarin and World War II commander Georgy Zhukov. President Vladimir Putin, who has quoted Solzhenitsyn in speeches, has ordered official celebrations for the centenary of the writer's birth in December. A statue of Solzhenitsyn is due to be put up on a Moscow street that bears his name. Putin handed Solzhenitsyn a state prize a year before his death. Increasingly nationalist and conservative in later years, Solzhenitsyn backed Putin's course.